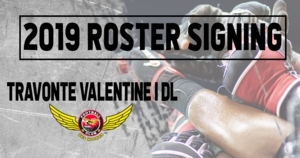 DES MOINES – The Iowa Barnstormers have signed defensive lineman Travonte Valentine to the 2019 roster, Head Coach Dixie Wooten announced today. Valentine (6-4, 295, Louisiana State) joins the Iowa Barnstormers for his first season in the Indoor Football League (IFL). Out of high school, Valentine was a highly touted defensive tackle who earned opportunity with Louisiana State University.